Quite often, poring over the menu can take up a surprisingly long time and, pardon the pun, this eats into dining time which can be precious, especially at lunch. 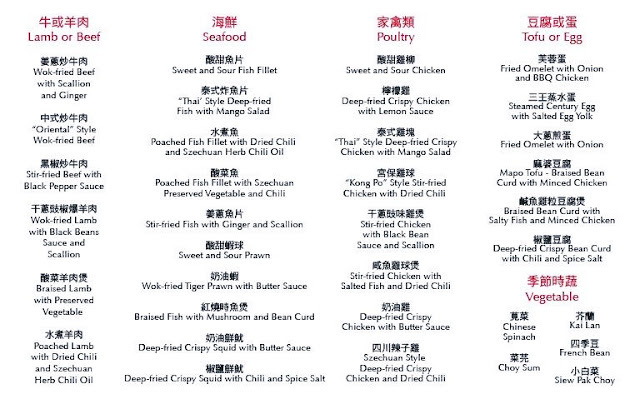 A limited set menu is always a good idea but sometimes, we may not like what’s listed. With that in mind, Chef Bryan Teh of The Emperor at Dorsett Grand Subang offers a compromise in his Mix ‘N’ Match Promotion. Available for lunch and dinner, the menu comprises 4 courses (for 4 pax), 6 courses (6 pax) and 8 courses (8 pax (see prices below). 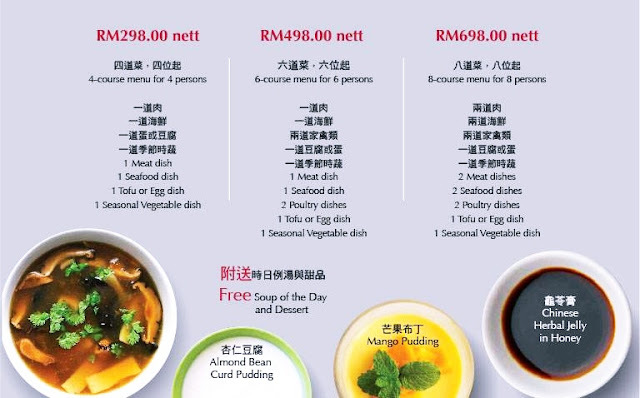 In reality, there are an additional 2 course for all because Mix ‘N’ Match comes with complimentary Soup and Dessert of the Day. 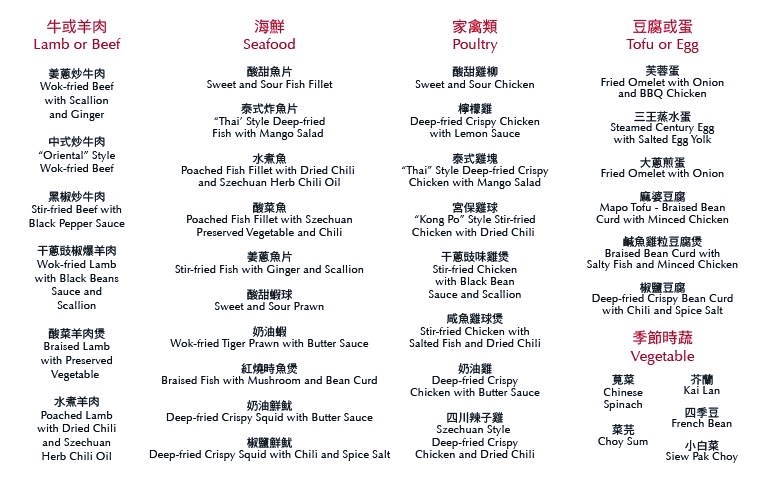 Although there are 7 in our group, we pick the 6-course meal with 1 meat dish, 1 seafood dish, 2 poultry dish, 1 tofu or egg dish and 1 vegetable. Soup of the Day happens to be double-boiled lotus root. It’s an aromatic brew with chicken, lotus root, peanut, the invigorating yuk chuk herb and goji berries. So good I tipped the bowl to get every drop. The Mix ‘N’ Match promotion highlights Sichuan specialties, which means lots of hot chillies. We start with Poached Fish Fillet with Dried Chilli and Sichuan Herb Chilli Oil. All we can see is a fiery red dish of chilli oil and dried chilli. But peer closer and you’ll see the snow white slices of fish fillet underneath. The ma lat gravy adds oomph to a bowl of steaming hot rice. Amazingly, the hot dried chilli and Sichuan peppercorns accentuate the juicy sweetness of the fish. More chilli comes with Sichuan-style Deepfried Crispy Chicken. The cubes of deboned chicken look dry but one bite vapourises all doubt. Under the crisp exterior, each piece of meat is soft and tender. Comes with roasted cashewnut and a sprinkle of sesame seeds. We then soothe our palates with less pedas fare. But the Braised Lamb With Preserved Vegetable, served in a claypot, is no less exciting. The sliced meat is tender and moves in a sensuous rhythm with the salty preserved vegetable. Again, rice is perfect to go with this dish. I am not too enamoured of Sweet & Sour Chicken but then I must confess to being prejudiced when it comes to sweet and sour dishes. But everyone else thinks it’s good enough to clean the plate. It’s a bit difficult to choose between tofu and egg but finally, we settle on Fried Omelette with Onion & Barbecued Chicken. Hmmm… an interesting omelette with the coarsely chopped chicken adding a contrasting texture to the soft onions and fluffy egg. Must remember to get Sichuan-style Mapo Tofu with Minced Chicken on the next trip or the Deepfried Crispy Tofu with Chilli & Spice Salt. For vegetable choices, there’s spinach, mustard leaf, kalian, French bean and Xiu Bok Choy. The day we are there, an additional vegetable of the day is available, so we happily munch on Green Dragon Chives stirfried with garlic and beansprouts. The clear flavour is just the thing to appease the palate after all the hot chilli we eat earlier. Three choices of dessert make it easy to decide. There’s almond beancurd pudding, mango pudding and Herbal Jelly With Honey. Chef Bryan recommends the Herbal Jelly which will cool our body after all that heat from the chilli and peppercorn.